In the city of Dhahran, a vast array of curious forms shaped like pebbles rises out of the desert. 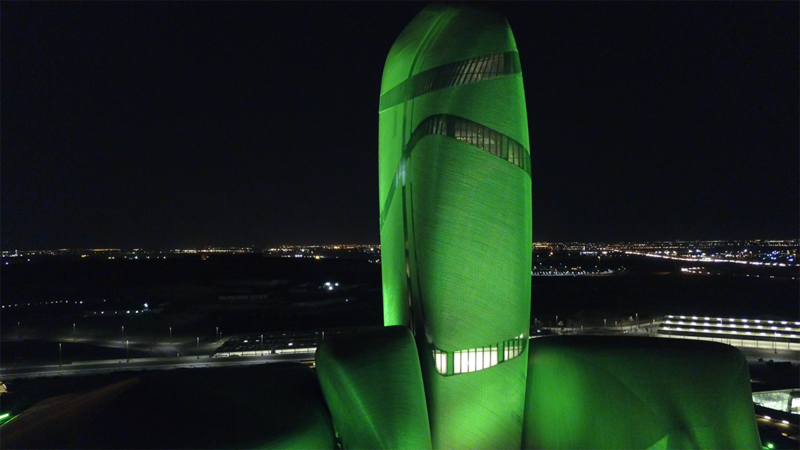 This is Saudi Arabia’s new Cultural Centre. Set to become a national and global landmark, the site contains an auditorium, cinema, library, exhibition hall, museum, and archive within its 100,000 square metres. Aramco, working with Filmmaster, approached lighting designers Magic Monkey and project managers Netherled, who proposed an installation of more than 150 Pulsar Luxeos 36 VC flood lights. The Luxeos units were chosen as one of the only products durable enough to survive in the scorching heat and dust of the desert, and due to the product’s best-in-class light quality. Netherled’s installation uses a control system as impressive as the light fixtures themselves. All the lights can be controlled individually, and the standard programs can be overridden for special events. Over such a large area, the control of individual luminaires produces some unique and stunning results. Pulsar’s Luxeos 36 floodlights have on board RDM (remote device management) software, and the customer is using this to gather and monitor data about the performance and lifetime of the fixtures. The layout of the site posed some challenges, as all the luminaires had to be situated on the ground rather than attached to the building. 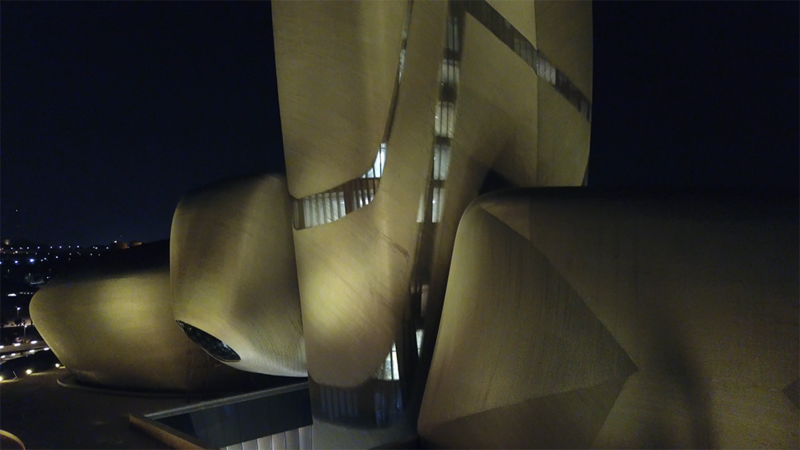 Even with some of the light fixtures situated as far away as 160 metres from the building itself and others right next to the façade, Pulsar’s HBS (Holographic Beam Shaping) technology made it possible to get a uniform spread of light. HBS technology uses thin sheets of highly efficient diffuser materials to shape the light beams, which meant each light fixture could produce the exact spread of light needed. The lights were further customised, with each finished in an oyster white colour to help them blend in with the surroundings and look discreet in the day time. Some of the lights are installed close to pedestrian areas and roads, so the customer chose to use louvres to prevent glare. The louvres were also finished in the same oyster white colour to match the light fixtures. The Luxeos 36 RGBW LED flood light is the highest-power fixture in the Luxeos range. 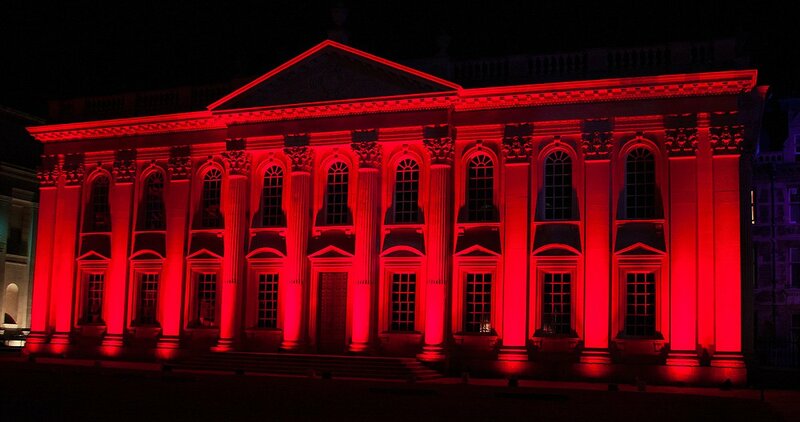 Designed to deliver a stunning array of colour at source, it represents the culmination of 45 years of experience in delivering lighting solutions for creative, entertainment and architectural LED lighting projects. The Luxeos 18 RGBW LED flood light comes from the same range as the flagship Luxeos 36 but is about half as powerful. It features the same high-quality components and light engines as its bigger brother. 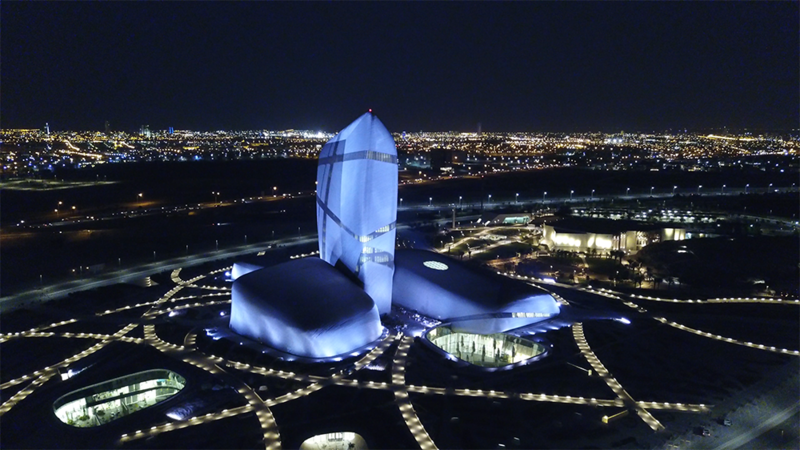 The sheer scale of the lighting scheme makes the King Abdulaziz Center for World Culture a key feature of Dhahran’s skyline at night, cementing the building’s status as a national landmark for Saudi Arabia. 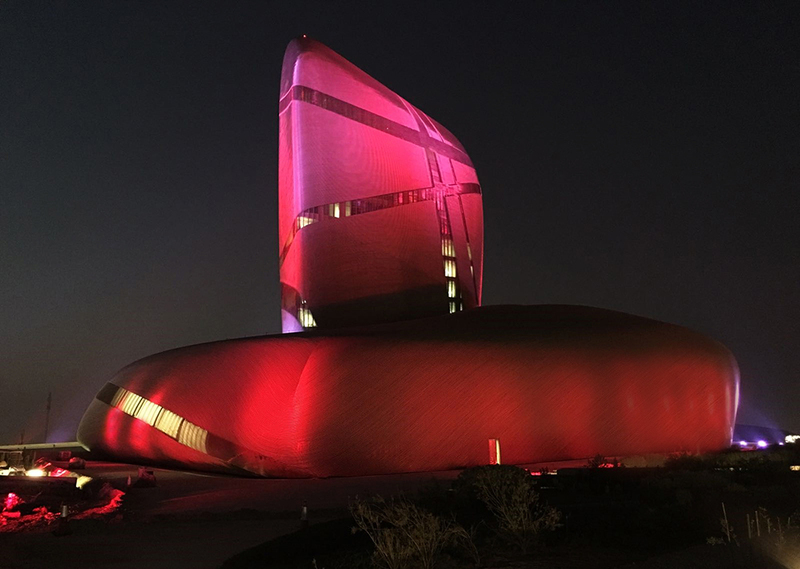 This installation is the latest in a line of large scale installations that Pulsar has worked on in the Middle East, including Bahrain’s World Trade Center and Royal University for Women.